Congratulations ! The original artwork is available for purchase for $2536.60 shipping included. You will be able to review this purchase in the subsequent screens. If you have a question, please email support@pastelspace.com. Purchase 2579 x 1500 pixel digital file by using the Buy Now buttons below. You will receive an email with the download link. You can use the link 5 times to download the digital file. Executed in the artist's signature style, this impressionist work in warm vibrant shades combines well with the cool shades of blue. The result is stunning, with various hues & strokes forming an exquisite composition. 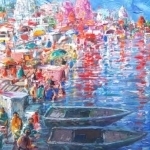 Varanasi (Hindustani pronunciation: [ʋaːˈraːɳəsi]), also known as Benares, Banaras (Banāras [bəˈnaːrəs] ), or Kashi (Kāśī [ˈkaːʃi]), is a city on the banks of the Ganges in the Uttar Pradesh state of North India. In the Rigveda, an ancient Indian sacred collection of Vedic Sanskrit hymns, the city is referred to as Kāśī (Kashi) from the Sanskrit verbal root kaś- "to shine", making Varanasi known as "City of Light", the "luminous city as an eminent seat of learning". The name was also used by pilgrims dating from Buddha's days. The artist Tejinder Kanda seems to dig into his recollection of a carefree childhood spent in the open fields and clean air of lush green rural Punjab & the hills around the area as the spring for his art. The impressionist style of painting with thick impasto work led by French and European Masters beginning the 19th-century has clearly influenced the artist's work. 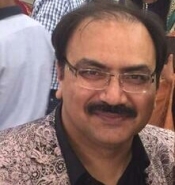 An avid admirer of Claude Monet and John Constable amongst others in the genre; Tejinder has evolved his own distinct idiom. There is an interesting mix of abstraction and realism interspersed with landscapes that add an ethereal touch to his work. 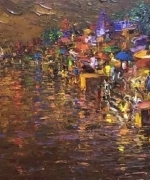 A dramatic rendering of reflections in water and the play of light and shade are other familiar elements in much of his creative imagery. Partly dreamy and partly representational, the compositions capture the artist's perception of life and the world around- its landscapes, fleeting moments and happenings. The renderings are tacit imprints of personal memories desires and experiences primarily as general impressions. 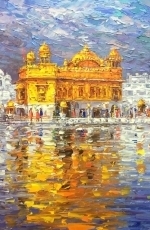 Clear thick visible brush strokes in bright colours set against a softer palette, are a hallmark of Tejinder's large body of impressionist expressions. Delhi artist Tejinder Kanda seems to dig into his recollection of a carefree childhood spent in the open fields and clean air of lush green rural Punjab & the hills around the area as the spring for his art. The impressionist style of painting with thick impasto work led by French and European Masters beginning the 19th-century has clearly influenced the artist�s work. An avid admirer of Claude Monet and John Constable amongst others in the genre; Tejinder has evolved his own distinct idiom. There is an interesting mix of abstraction and realism interspersed with landscapes that add an ethereal touch to his work. A dramatic rendering of reflections in water and the play of light and shade are other familiar elements in much of his creative imagery. Partly dreamy and partly representational, the compositions capture the artist�s perception of life and the world around- its landscapes, fleeting moments and happenings. The renderings are tacit imprints of personal memories desires and experiences primarily as general impressions. 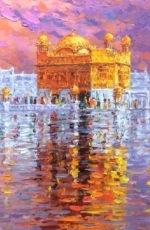 Clear thick visible brush strokes in bright colours set against a softer palette, are a hallmark of Tejinder�s large body of impressionist expressions.